On a mission, conservation of wildlife and landscapes! 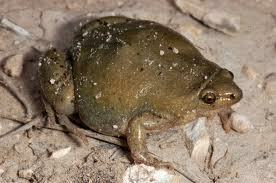 Family: Microhylidae, Narrow-mouthed Frogs view all from this family. Description: Brown-gray/green with black/white spotting. Pointed snout, fold of skin on back of head. Mottled belly, dark throat on males. Voice: Similar to the bleat of sheep. Breeding: April-October. Rainfall is the start. Eggs attached to vegetation in water, floats on the surface. Habitat: Edges of ponds or ditches. No News Available From Source today.